Termination: Top or side termination is available as a standard feature at no additional cost. Module Size: There are various module sizes, a 6-cell module for 7 thru 15 plate cells and a 3-cell module for 17 thru 33 plate cells. These module sizes are our most popular configurations. For special space requirements, there are two additional sizes, a 4-cell module for 7 thru 15 plate cells and a 2-cell module for 17 thru 33 plate cells. It offers more choices in configuring the battery system, provides more flexibility when selecting height and lengthof your particular system configurations, and enhances overall space saving and versatility. 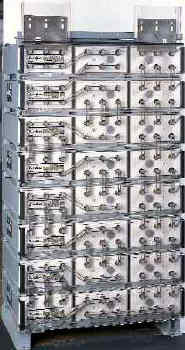 Maximum Modules: Modules can be stacked from one module high all the way up to eight modules high and still meet UBC 97 seismic zone 4 standards (using a one-piece base). Connector Package: Our standard connector package meets discharge rates as low as the one hour rate to 1.75 vpc. Optional packages are available to provide the proper hardware for your higher rate applications. stacks. For side termination add additional 6" (3" per side). multiply by number of modules and then add 1.5." 1.5" for terminal bracket and 6.25" for top shield.